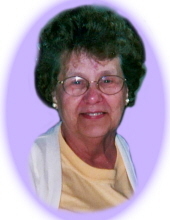 Mary J. Hamrick, 89 of Point Place Toledo, OH, passed into God's care on Thursday, November 1, 2018. She was born to the late Samuel H. and Adaline (Eding) Ross on February 18, 1929. Mary was a homemaker. She is a member of the Messiah Lutheran Church. Mary and her husband enjoyed going to their log home in the Upper Peninsula of Michigan. They would travel to Florida in the winter. Mary is survived by her husband of 69 years, Richard Sr.; sons, Richard (Darla) Hamrick Jr. and Thomas (Joyce) Hamrick; many grandchildren & great-grandchildren, nieces, and nephews. She was preceded in death by her sons, Scott and Timothy Hamrick; sister Gerry Craig, and brother, George Ross. Services were private. David R. Jasin-Hoening Funeral Home was entrusted with arrangements. Contributions can be made to Hospice of Northwest Ohio. To send flowers or a remembrance gift to the family of Mary J. Hamrick, please visit our Tribute Store. "Email Address" would like to share the life celebration of Mary J. Hamrick. Click on the "link" to go to share a favorite memory or leave a condolence message for the family.